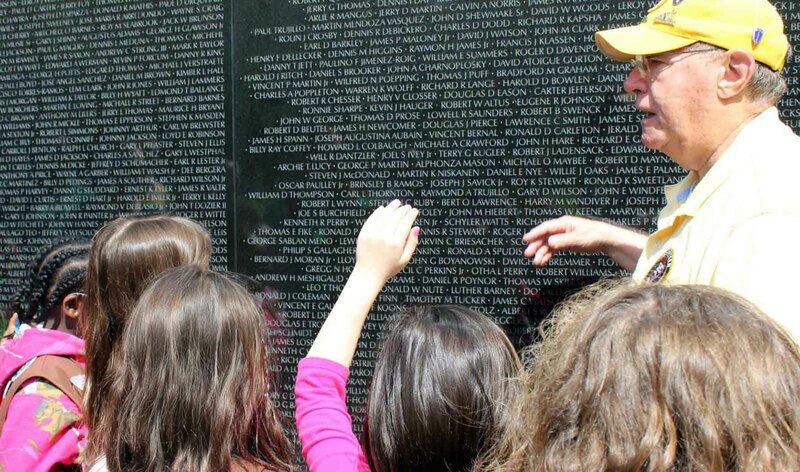 To one unfamiliar with it, it is just a wall – panels filled with names – but for the men and women who served in Vietnam, and the loved ones left behind, it represents loss, sacrifice, memories and healing. The Tennessee Valley community recently had an opportunity to pay their respect to the nation’s Vietnam veterans without ever boarding an airplane for Washington, D.C., when The Wall That Heals made a stop in Huntsville, Ala. The three-quarter scale replica arrived in Huntsville Oct. 30 from Paducah, Ky., and was open 24 hours a day until 3 p.m. Nov. 4. The Wall’s presence in the Rocket City provides a venue for the young and old alike to learn more about the Vietnam War and to say thank you to those who served. But, more importantly, it will give Vietnam veterans a chance to grieve, remember and heal. Presented by Intuitive Research and Technology and hosted by Vietnam Veterans of America Chapter 1067 in partnership with the Redstone-Huntsville Chapter of the Association of the United States Army, the Huntsville/Madison County Veterans Memorial and the City of Huntsville, The Wall That Heals stands at 7.5 feet tall at its highest point and is 375 feet long. It bears the same 58,318 names on the same panels as the original, and just like the memorial in D.C., visitors can do name rubbings. “We all know the Wall,” said Bryan Dodson, one of the lead organizers. In addition to viewing the Wall, visitors could fully immerse themselves in the history of the Vietnam War by stopping by the mobile Education Center, as well as the nearby Jaycee building, which houses a variety of Vietnam War displays and exhibits, to include uniforms, equipment, weapons, a Huey helicopter. Over the course of the Wall’s four-day visit, more than 1,400 local students toured the site. “We want the students to remember and learn about the event,” said Laura Ayers, who organized the educational tours. “It is about covering the whole conflict and making sure they can remember and have that opportunity – and to say thank you. The traveling Wall last stopped in Huntsville 18 years ago. About two years ago, retired Brig. Gen. Bob Drolet recommended it make another visit before it’s too late for many of the Vietnam veterans. “A lot of people have not been to the Wall in Washington, and it has a tremendous effect when you go up there,” said Pete Fast, one of the lead organizers. The Wall also reached out to those who did not serve in the war, but may have contributed to the disrespect members of the military experienced at the time, Dodson said. “They feel like they need to do something to honor this era, because they themselves, and others, mistreated the veterans of the Vietnam era,” Dodson said. Huntsville had to apply to bring the Wall to the city, and is one of about 30 locations it will visit in 2018. Since the Rocket City’s request was accepted, a core team of seven organizers, with countless others supporting them, worked tirelessly organizing operations, volunteers, security, education and a variety of other pieces. Many are Vietnam or Vietnam era veterans. “Our nation is what it is because people have been willing to stand up and sacrifice. Certainly our Vietnam veterans are a great example of that,” said John Hamilton, Huntsville city administrator.